The beautiful design is pleasing to the eyes. The iPrint towels are very soft and are very comfortable to use.They can be used by Kids, Teens, and Adults. They are unisex towels. The towel is made of cotton known for its softness, absorbency, and durability. These towels make an ideal complement to any bathroom whether you use it to pamper yourself or reserve it for special guests. Cotton fibers are valued for their superior length and strength, which also reduces the buildup of pile and lint. 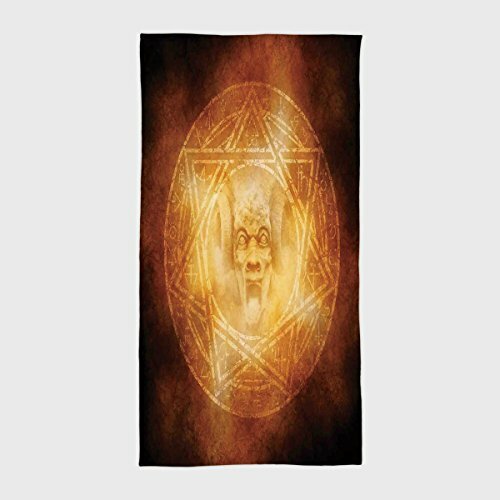 These towels will feel cozy and comfortable against your skin every time you use them. Additionally the towels get softer with washing and drying. Machine wash will not only keep the towels soft and comfortable as they already are but will also prolong its life. 03.Machine wash will not only keep the towels soft and comfortable as they already are but will also prolong its life. 01.Due to manual measurement, please kindly allow 1-2 cm discrepancy. 02.The digital images we display have the most accurate color possible but due to differences in pc monitors, we can't be responsible for variations in color between the actual product and your screen. Imported. Brand:iPrint.Include 1 towel.Only one side printing. Towels with popular print pattern measure 13.78"W x 27.56"L (35W x 70L cm). Material: Soft 100% cotton microfiber; Function: Absorbency and durability. Care Instructions: Machine washable and dryable. For best use, wash separately on first use. You may see some lint on the first wash which will diminish after each washing. This will not affect the look, feel, or performance of your towel set. The iPrint Towel will be a valuable addition to your luxury towel collection, and can be used by Kids, Teens, and Adults. If you have any questions about this product by iPrint, contact us by completing and submitting the form below. If you are looking for a specif part number, please include it with your message. © 2019 - utopyacon.com. All Rights Reserved.